Here you can see a list of all your farms. Again, some censored fields here. Anyway, you can see village names, how many times you have attacked, what your total bounty from that farm is and how many losses you have had at that farm. Also the last attack is shown. At the left side of the village name you see a little ‘+’ sign. If you click this, you will add that village to your farm list. This farm list is shown when you are viewing the map. A screenshot of this is shown below. What you see above, is the farm list. This farm list is shown right beneath your map. 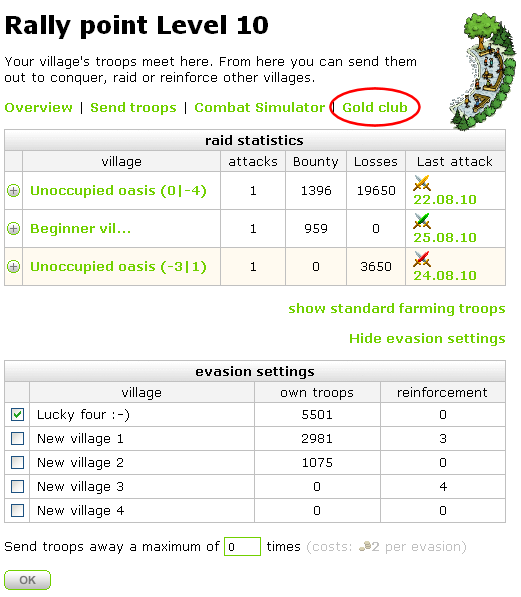 You can remove villages from your farming list by clicking the red X, or go to the rally point, click “Gold club” and click the small minus-signs in front of a village name. You can add villages to this list the same way, but then it will be a plus-sign then (see above).